Here is an essay I did for my last Media Studies course (a 200 level paper) on immersion, play, narrative and Half-Life 2. Enjoy! Video games, an ever popular form of new media, are often described as just mindless entertainment but there are games out there that let us experience emotions, immersion and extend ourselves in some way. Half-Life 2 (2004) developed by Valve is once such game. It is a first person shooter that feels truly immersive and toys with our emotions. Half-Life 2 as a game does extend our understanding of the self through narrative, identity of an avatar, play and as an immersive experience. The narrative tells a story to enrich and guide players through the experience. The avatar of Gordon Freeman is an embodiment of the self in as little characterization as possible. Through play the player can experience freedom and fun within the actual gameplay constraints. Immersion pulls players into the game, leaving their quiet lives on the sofa to a virtual world where the earth needs saving from alien destruction. 2 episodes you will get to spend a lot more time with Alyx and her relationship with Gordon will become a whole lot clearer. The main antagonist of Half-Life 2 is Doctor Wallace Breen who works with the aliens against Gordon and the resistance. There is also the mysterious G-man who seems to pop up in random places over your journey watching over you and sometimes appearing as a vision. The story in Half-Life 2 is fixed but it does makes an excellent thrill ride. “In video games, when players both act the roles in the story and determine the outcome by their choices and actions, the story is at the same time working on them – changing their experience” (DeMaria, 2007:46). Although in the case of Half-Life 2, you do not really have an impact on the story unless you end it prematurely with the death of Gordon Freeman. Of course you can always restart from that checkpoint. How the narrative is delivered to the player in Half-Life 2 is all the more intriguing. The narrative is interwoven nicely into the game itself. Narratology shows that the narrative plays its role in helping this game become what it is. Without it, players would get immediately disinterested in the world and might even consider not to carry on playing. In Half-Life 2 there are no levels, you live a continuous life although the game is divided into chapters. The narrative is really only unveiled through wherever Gordon is and through dialogue between other characters as they speak to you. There are no cut scenes chopping up the game at all, although at the start and end of the game there are parts you have no control over but it is still shown from Gordon’s perspective. “Narrative material can also be provided by ‘in-game’ devices, more seamlessly integrated into the game-world”. 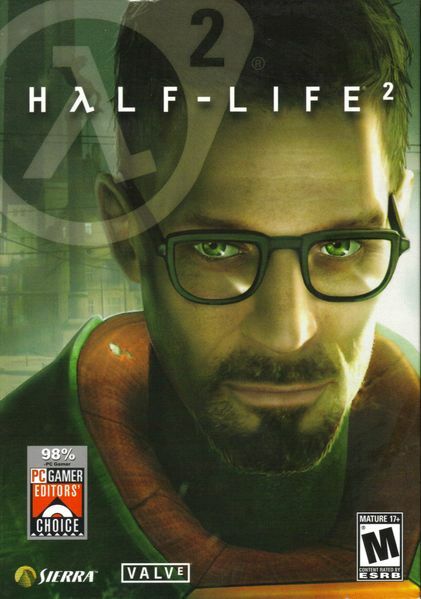 The original “Half-Life marked a notable development in this direction, avoiding cut-scenes or other information that has to be accessed outside the main game-space” (King and Krzywinska, 2006:45). The sequel improved on that greatly with amazing animation and facial expression, I really felt like I was inside scenes of a science fiction film. “Scenes important to the plot of Half-Life remain fully interactive, allowing the player to move around while information is relayed by non-player characters and other integrated devices” (King and Krzywinska, 2006:45). You still cannot affect the story in any way but sometimes you as a player can actually reach for more information. When you look at some props for long enough, characters like Alyx’s father Eli will talk to you about a certain topic for example newspaper clippings will trigger Eli mentioning a Seven Hour War, a backstory to the Half-Life universe. Although it looks like you are free, the game is very linear made up mostly of a lot of scripted events. There are breaks where the game pauses and loads, a loading bar shown on the screen does takes away my immersion but only for a few seconds. Gordon Freeman is more than just another character; his success is your success, his pain is your pain. You are Gordon Freeman. As Half-Life 2 is a first person shooter you never see your face in the game, only on the box. Also Gordon does not talk, at all. All these instances lead to it being easier to indentify with him as a character, you become him. Your personality is now his. First person shooters offer far more immersion than any other genre as you are looking through a second pair of eyes, the eyes of the avatar. You start off as a prisoner with no power, treated like scum by the Combine soldiers. As you escape and progress through the game you become stronger with better weapons, vehicles and a Zero-Point Energy Field Manipulator, easily known as the gravity gun, which allows you to grab and hurl large objects. In fact near the end of the game when your gravity gun gets supercharged you are easily able to fling Combine soldiers around like rag dolls. This is a huge narrative and play contrast to the start of the game. When I become Gordon Freeman I feel stronger, more powerful and also less fearful because I know there is life after death. I am still afraid of losing my life and having to restart from a checkpoint but if there was no such thing as reviving I would probably act a lot stealthier than I actually do and try to avoid danger. Even though trouble always manages to catch up with Gordon Freeman somehow. Gordon’s main weapon of choice, the crowbar, is an everyman’s weapon something that we could actually own in real life, which he can use to smash through obstacles and as a weapon against enemies. Not only is it an instantly recognizable trait of Dr. Freeman but the feeling of smashing boarded up doors to clear a pathway for myself, I have never experienced in any other game and yet it all feels so natural. Gordon is more often than not traveling on his own, allowing you to feel even more like a hero, able to change the world in a single day. “The figure of the individual hero, the player-character, faced with some kind of upheaval… [and] the hero is, typically, presented as a figure hyperbolically reduced to the status of lone individual assaulted from all sides, with the exception of the occasional ally” (King and Krzywinska, 2006: 173). This is akin to other media as well including films with many action heroes such as Sylvester Stallone as Rambo and Bruce Willis as John McClane, able to take on the world with their superhuman endurance. Of course the main reason people like I play games, is to interact and control the experience through the means of play. An interactive video game allows a play-er to play and this is exactly what Half-Life 2 allows you to do. The main gameplay of Half-Life 2 is made up of shooting, driving and puzzle sequences. Ludology shows that you cannot have an interactive game without play. The term paidea is used to describe gaming moments that are unstructured and spontaneous. Half-Life 2 is “an example of a shooter in which widespread collateral damage can be caused for its own pleasure, as a mark of the player-character’s agency in the on-screen environment” (King and Krzywinska, 2006:14). I often do get distracted sometimes while playing games, I might come up with a goal in mind that the game will probably not reward me for but I do it anyway for the joy of spontaneous fun. Like seeing the biggest explosion I can make if I stack enough explosive barrels on top of each other. Ludus is the term to describe game rules in which paidea is contained (King and Krzywinska, 2006:10). Which means that while I still have to follow the linear narrative I am still free at most stages to muck about essentially. In games such as Half-Life 2 “restriction predominates. The gamescape consists of seemingly endless sequences through which the player is encouraged to move in a primarily linear fashion. Some scope is given for paidea, primarily in the form of non-essential destruction of the environment, but relatively little in the way of freedom to explore” (King and Krzywinska, 2006: 81). Without worrying about where to go this restriction also aids in a little something I (and others I’m sure) like to call immersion. stays in first person, “the first-person perspective survives lethal encounters, creating the strange impression of being able to look around through the otherwise immobilized player-characters eyes” (King and Krzywinska, 2006: 109). A red filter covers the screen to confirm your demise but your guts are not splattered across the level like in the original Half-Life. The onscreen Heads-Up Display displays the value of your current health, shield, and ammo. This does detract from complete immersion but in the case of Half-Life 2 it could be considered as information from the HEV (Hazardous Environment) suit just like the female robotic voice announcing that you have entered a toxic area. In Halo 3 there is a similar graphical interface, but it is explained because the main character Master Chief is in a hi-tech suit with an information relaying helmet. Yet the character of Gordon Freeman is never shown wearing a helmet of any kind so the icons we see onscreen, Gordon would never actually see, if he was a real person. Plus while choosing a weapon, the weapon selection icons appear in the middle of the screen. Half-Life 2 is not as subtle as Peter Jackson’s King Kong: The Official Game of The Movie which has no Heads-Up Display at all but sometimes ease of use does work a lot more in your favour than just plain realism. Half-Life 2 is not an easy game to sum up in just a single paragraph; it really must be played and experienced. Half-Life 2 is my favourite video game of all time for a reason. A simple enough premise becomes an entangling narrative with backstabbing characters along with threats to the safety of your ally friends. The design of play is contained within linear walls while still leaving the player with enough freedom to discover and destroy at their will. When we identify with Gordon Freeman as a character we are actually becoming him, making his motives our own. Immersion is a huge concept in video games but with Half-Life 2 in particular it bottles right down to it being in first person and never-ending. Half-Life 2 extends our understanding of the self as a player, a person with the ability to play as somebody else within a new story and a different world. In the end that is why we play games, to escape from reality and its constraints on our lives. King, Geoff and Krzywinska, Tanya. Tomb Raiders & Space Invaders: Videogame Forms & Contexts. I.B. Tauris & CO Ltd, 2006. pp. 45, 173, 14, 10, 81, 109. DeMaria, Rusel. Reset. Berrett-Koehler Publishers, INC. 2007. pp. 46. McMahan, A. “Immersion, Engagement, and Presence: A method for analysing 3-D video games”. The Video Game Theory Reader. M.J.P Wolf & B. Perron (eds.). London: Routledge, 2003, pp. 68. Giddings, Seth and Kennedy, Helen W. “Little Jesuses and *@#?-off Robots: On Cybernetics, Aesthetics, and Not Being Very Good at Lego Star Wars”. The Pleasures of Computer Gaming: Essays on Cultural History, Theory and Aesthetics. M. Swalwell & J. Wilson (eds.). North Carolina: McFarland, 2008. pp. 17.